Laura Rhatigan, a member of the Cadets color guard from Salem, Mass., submitted this one. She has marched in the Cadets since '03, and will age out next summer. "This picture was taken in Bristol, R.I., the day of the Bristol show. 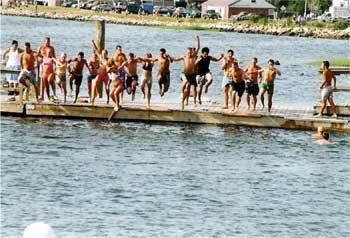 After finishing rehearsal on what was an extremely hot day, a bunch of us from the color guard ran down to the dock that was next to the field we were practicing on and jumped into the ocean. It was freezing but extremely refreshing. "This is one of my favorite places to practice, minus the wind. Having our rehearsal field right on the ocean in the middle of Bristol is amazing. And there is an ice cream store across the street!" Thanks Laura! E-mail your best shots from the summer to dave@dci.org along with where and when the photo was taken. Send some biographical information about yourself as well. We'll give you full credit. Also, let us know if you want your e-mail address included.